The announcement of the commencement of trial production for the Kia SP2i mid-size SUV also brought with it a chance to appreciate the styling of the model, apart from what we've seen on the SP2 Concept seen at the Auto Expo last year. A pre-production SP2i was showcased, albeit wearing test-car camouflage over its major styling features and covering its interiors. What we know so far is that Kia, the sister concern to Hyundai Motors, has based the SP2i on the Hyundai Creta. First impressions indicate that dimensions of the two will be very similar, with the SP2i displaying very nearly identical characteristics aft of the blacked-out A-pillar, especially in the rake of the windscreen and D-pillar. 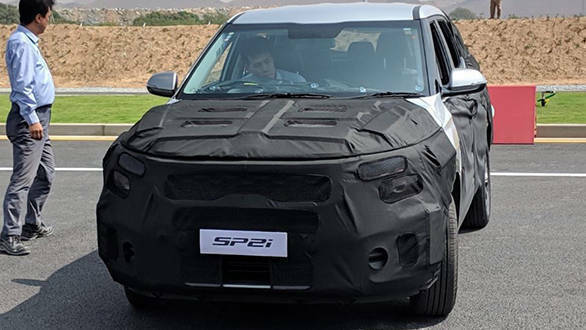 Beneath the camouflage, it is apparent that the SP2i will carry a broad interpretation of the Kia family grille, flanked by twin-stacked headlights, as seen on the SP2 Concept. 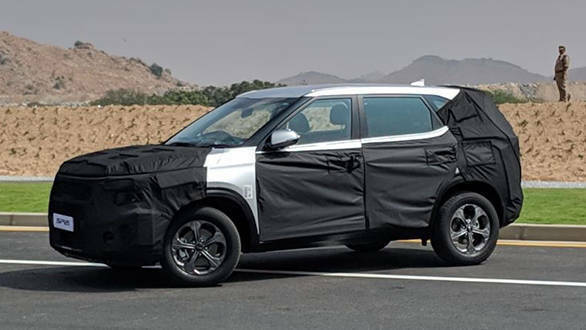 It appears to be riding on 17-inch alloy wheels, with disc brakes on all four corners, while the Creta gets disc brakes only on the front wheels. Around the rear, it appears the lower half of the bumper will get a similarly aggressive design, again faithful to the SP2 Concept. Going by how close the pre-production SP2i is to the concept, we can look forward to Kia's first SUV due in September very keenly indeed.